Never before has there been a women’s basketball selection show quite like the one ESPN aired on Monday evening. There was no mystery to it since the network had mistakenly revealed the entire NCAA tournament bracket earlier in the day. The awkward dud of a Selection Monday shouldn’t spoil a tournament that we can only hope will live up to last year’s dramatic edition. Here are 16 things to know about this year’s women’s NCAA tournament, including a prediction for which team will be climbing ladders and cutting down nets in a few weeks. 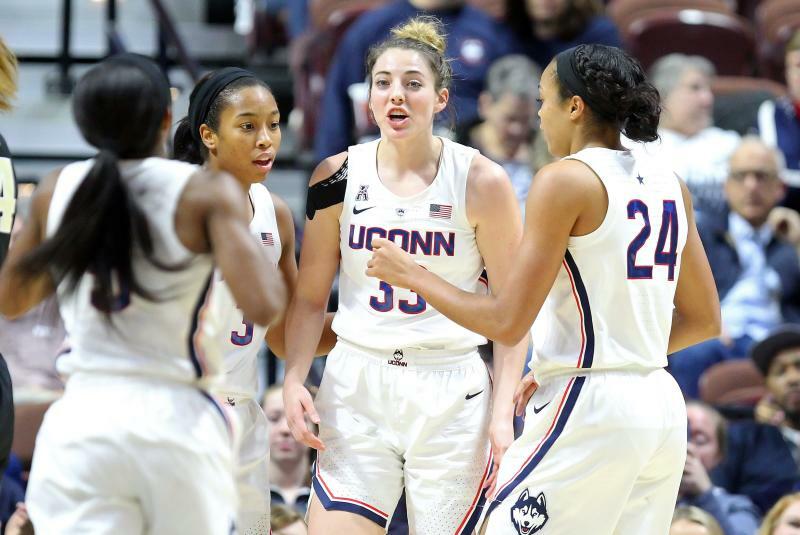 For the first time in 13 years, the UConn women are not a No. 1 seed. The committee awarded the Huskies a No. 2 seed even though they’re 31-2 and ranked No. 2 overall in the AP poll. UConn had joined Baylor, Notre Dame and Louisville on the No. 1 seed line in the NCAA’s most recent bracket reveal, but Mississippi State jumped up to grab a spot by sweeping the SEC regular season and tournament titles. That left the committee to decide between UConn and Louisville for the last No. 1 seed. The Cardinals (29-3) edged the Huskies thanks to their superior strength of schedule playing in the ACC and their head-to-head victory in Louisville on Jan. 31. 2. WHO WERE THE LAST TEAMS IN? The big story entering Selection Monday was whether Tennessee would extend its streak of reaching every women’s NCAA tournament. That 38-year streak is indeed still alive, but only by the slimmest of margins. The Lady Vols (19-12) were one of the final at-large teams to make the field, securing a No. 11 seed in the Albany Region despite a bloated No. 60 RPI, a sub-.500 record in SEC play and a head-scratching loss to last-place Vanderbilt. Five top-50 victories including a big one at Texas were enough to save them. Tennessee wasn’t the only bubble team to sneak into the field. Indiana (10), Auburn (10) and UCF (12) all got good news Monday. 3. WHO WERE THE BEST TEAMS LEFT OUT? Arkansas’ improbable run to the SEC title game was not enough to send the Razorbacks to the NCAA tournament. They were snubbed despite a 20-14 record and victories over Texas A&M, South Carolina and fellow bubble team Tennessee. Among the other bubble teams who did not hear their names called were Ohio and TCU. The Bobcats (27-5) lost to Buffalo in Saturday’s MAC title game, while the Horned Frogs (20-10) finished sixth in the Big 12 and failed to secure the league’s automatic bid. 4. WHICH LEAGUE LANDED THE MOST BIDS? For the second consecutive season, the ACC is sending over half its conference to the NCAA tournament. The league landed eight NCAA bids, one more than the SEC and two more than the Pac-12. Notre Dame and Louisville both snagged No. 1 seeds, while Syracuse and NC State were on the No. 3 line. The other four ACC teams to make the field of 64 were Miami (4), Florida State (5), Clemson (9) and North Carolina (9). Imagine you’re Maryland. You’re 28-4. You’re ranked No. 9 in the AP poll. You won the Big Ten outright. And your reward for all that is likely having to go through scorching-hot UCLA in the round of 32 and angry, motivated UConn in the Sweet 16 just to earn the right to face No. 1 seed Louisville in the Elite Eight. Yikes. Maryland’s treacherous path is the perfect example of why the Albany Region is by far this NCAA tournament’s toughest. It includes six top-20 teams in the most recent AP poll: UConn (2), Louisville (5), Maryland (9), Oregon State (11), Gonzaga (16) and UCLA (20). When the NCAA selection committee’s mid-February mock bracket had top-seeded Baylor in a region with Notre Dame and Maryland, an angry Kim Mulkey called it a “bad bracket.” The Baylor coach said “that bracket was not fair, that bracket was not balanced” because the No. 1 overall seed was given too tough a path. Mulkey is probably much happier Monday given the gift of a region the Bears got. Second-seeded Iowa (26-6) lost by 34 at Notre Dame earlier this season and is not quite the same caliber as the other No. 2 seeds. Third-seeded NC State (26-5) peaked early and has dropped five of its past 10. And fourth-seeded South Carolina (21-9) also faded a bit down the stretch. 1. Megan Gustafson, F/C, Iowa — The nation’s leading scorer has handled whatever defenses opponents throw at her. She is averaging 28 points and 13 rebounds and tallied 45 and 10 in the Big Ten title game against Maryland. 2. Sabrina Ionescu, G, Oregon — The two-time Pac-12 player of the year is the conductor of one of the sport’s most prolific offenses and has a record 17 triple-doubles in her career. 3. Arike Ogunbowale, G, Notre Dame — She’ll forever be remembered for her two buzzer beaters at the 2018 Final Four, but Ogunbowale has been special as a senior too, averaging 21 points per game. 4. Asia Durr, G, Louisville — There’s not a more explosive scorer than the two-time ACC player of the year, as evidenced by the 47 points and 11 3-pointers she dropped on NC State earlier this season. Rice boasts a 28-3 record, a No. 21 national ranking and a winning streak that dates back to December. Somehow, someway, the Owls wound up with a No. 12 seed as a result of their lack of schedule strength. Rice will have a chance to prove itself against fifth-seeded Marquette in what should be one of the bracket’s more compelling first-round games. The Golden Eagles have one of the sport’s most prolific offenses, while the Owls have one of the nation’s stingiest defenses. Twelfth-seeded Arkansas Little Rock got a gift drawing fifth-seeded Gonzaga in the first round of the NCAA tournament. The Zags (28-4) aren’t worthy of that seed because they’re without two of their four best players due to leg injuries. Point guard Laura Stockton, daughter of Gonzaga and NBA great John Stockton, and fellow starter Jill Townsend will miss the NCAA tournament after getting injured in Gonzaga's WCC semifinal victory over Saint Mary's on March 11. They did not play in the championship game, which Gonzaga lost to BYU. Even though it made the NCAA tournament, Tennessee may have a difficult time achieving its goal of atoning for the rockiest regular season in school history. The 11th-seeded Lady Vols drew a UCLA team that has won 11 of its last 14 and is peaking at the right time. The Bruins defeated Oregon, Arizona State and Cal during that stretch and nearly toppled the Ducks a second time earlier this month in the Pac-12 semifinals. There’s no guarantee that 10th-seeded Drake can survive Missouri in the opening round, but it would likely set up a really fun second-round matchup if the Bulldogs can do it. They likely would get a crack at in-state power Iowa in a rematch of a compelling 91-82 Hawkeyes victory from earlier this season. Drake entered Monday ranked No. 20 in RPI quality wins over Nebraska, Rutgers, South Carolina and Creighton. The Bulldogs are the rare double-digit seed in the women’s tournament that is capable of stringing together a couple wins. Way back on Nov. 10, Oregon rallied from six down with two minutes to play to edge Syracuse 75-73 in Eugene. Sign everyone up for a Sweet 16 rematch in Portland between the two top-15 teams. The second-seeded Ducks would need to survive Portland State and either Texas or Indiana to set up that game. Syracuse drew Fordham in the opening round, followed by potential dates with either South Dakota State or Quinnipiac. Not awarding UConn a No. 1 seed might have been the best gift the selection committee could have given Geno Auriemma. Now the Huskies coach has a perceived slight he can use to motivate his team. You can bet that would come in handy should UConn meet the team seeded No. 1 ahead of it in a regional final. It would be great theater if the Huskies get a crack at Asia Durr and Louisville with a Final Four berth on the line. This is not one of those years in women’s basketball when there’s a clear title favorite. At least seven teams can claim the national championship: Baylor, Notre Dame, Mississippi State, Louisville, UConn, Oregon and Stanford. That was the preseason top seven in the AP poll and those teams have spent the season jockeying for position with one another. Baylor and Notre Dame might be slight favorites among that group, but rest assured nobody is counting out UConn.